Welcome to your top West Villages real estate resource site! Centrally located on the Gulf Coast of Florida and 1 hour South of Tampa Bay, the West Villages is a vibrant, expanding community that is rich in its diversity and amenity offerings. It is located in Sarasota County between North Port and Venice. There are seven distinct neighborhoods boasting resort-style amenities that blend together to create a sense of community. With only minutes to local beaches in the Gulf of Mexico, shopping, delicious restaurants and easy access to the Myakka River, your adventure awaits! See all of TODAY's New Listings, search by beds/baths, square feet, pool, days on market & more! Are you ready to buy or sell a home at West Villages? Call your local West Villages real estate team, PROGRAM Realty at (941) 999-9900, for comprehensive help in the West Villages real estate market in Venice. In 2014, the area was named Best Sports-Friendly Vacation Destination by Sports Events Media Group. The homes are located near one of Florida’s oldest and largest rivers, the Myakka River, which stretches for 58 square miles. West Villages location makes it possible for a seemingly endless array of shops and restaurants. The community was also named as one of the Best Places to Open a Small Business. There are nearly 100 local clubs and volunteer opportunities to choose from. Children attend A-rated schools in the Sarasota County School District and have access to several community playgrounds. West Villages are also located in close approximation to the State College of Florida. West Villages’ Grand Palm was named as one of the 50 best communities in the United States in 2017 by Where to Retire magazine. West Villages is just minutes from Interstate 75 and about an hour South of Tampa Bay, approximately 60 miles. The Sarasota-Bradenton International Airport is a 45-minute drive making travel simple and convenient. Forbes listed Venice as one of the best cities to retire to and Coastal Magazine listed it as one of the top ten happiest seaside cities. Gulf Beaches are just minutes away. There is always a gorgeous sunset to catch along with boating, swimming, and fishing. Your tropical oasis awaits! Home values are expected to increase in West Villages as it is within close proximity to the upcoming Spring Training Camp for the Atlanta Braves. West Villages ranked 5th in sales in the United States in 2017 with properties ranging from the low $200,000s to the upper $600,000s. Housing options include single-family homes, coach homes, executive homes, manor homes, townhomes, and twin villas. There are also opportunities for multi-generational living. Whether you are looking for a maintenance-free property or a home with adequate space for entertaining, West Villages has the perfect location to fit your needs. Englewood, Venice, North Port, and Nokomis are nearby cities and towns for you to explore. West Villages are also located near the State College of Florida. The communities are within driving distance to Siesta Key Beach, America’s #1 rated beach. With properties ranging from the low $200s to the upper $600s, West Villages ranked 5th in sales in the United States in 2017. Map and Video Courtesy of West Villages Land Partners LLLP. 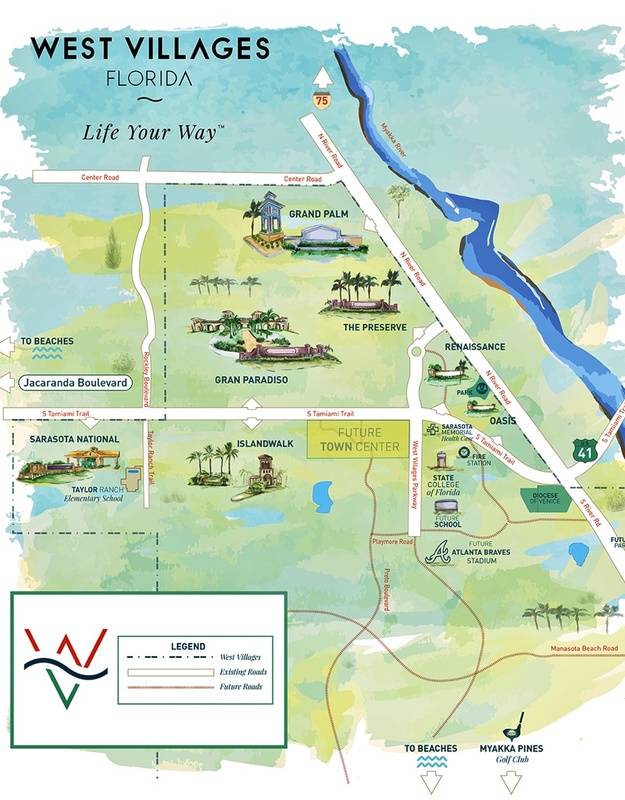 West Villages is centrally located along the Southwest Coast of Florida. It borders the Gulf of Mexico with its location being just an hour south of Tampa Bay. West Villages has seven distinct neighborhoods each featuring countless amenities for you to enjoy within close proximity to the Gulf of Mexico. These communities include Gran Paradiso, Grand Palm, Island Walk, Oasis, The Preserve, Renaissance, and Sarasota National. Each has their own unique style yet they seamlessly blend together to create a sense of community. Gran Paradiso is a Tuscan-inspired gated community offering executive, coach, state, and townhomes with lake and preserve views. Grand Palm is a nature-centered community with an endless array of onsite amenities including its own private island. Islandwalk is one of the fastest selling neighborhoods in the area for almost a decade thanks to its quick access to the Gulf of Mexico and modern conveniences. Oasis features homes lined along a nature reserve within walking distance to the Myakka River and immediate access to pristine golf courses. Renaissance homes are complemented by a wealth of amenities including a resort-style clubhouse and a private 32-acre park. Sarasota National is home to a championship 18 hole golf course and over 1,300 acres of preserve and nature space. The Preserve home sites feature water or nature preserve views and local access to the beaches of the Gulf of Mexico. Are you looking to buy or sell a home in the West Villages? Our Venice real estate agents are ready to help guide you through the process of buying a home in the Grand Palm community. We have the expert knowledge of the market dynamics that are unique to the Grand Palm real estate market. We are here to help! Contact us for more info on the West Villages!